Last week Marvel Comics stunned fans when they released a preview image that simply stated, “DEATH OF SPIDER-MAN.” Zero explanation was givenas to the nature of this tease, but today Marvel revealed some details about this upcoming story. 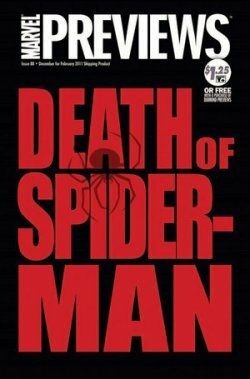 Coming in February, “Death Of Spider-Man” will be part of a story in the Ultimate Marvel Universe featuring the titular character as well as The Ultimate Avengers and The New Ultimates. This story arc is being written by longtime Ultimate Marvel writers (and modern comic legends) Brian Michael Bendis and Mark Millar. The story will begin in Ultimate Spider-Man #153 and continues in Ultimate Avengers vs New Ultimates #1. Ultimate Marvel is a side Marvel Universe where the classic Marvel Comics characters got their start in the modern day, tackling modern day issues. It also gives the writers a chance to take big risks with characters and do things that they wouldn’t be able to in the main Marvel Universe that has been alive since the 1940’s. Ultimate Spider-Man #’s 153 and 154 are written by Bendis with pencils by Sara Pichelli and David LaFuente. Ultimate Avengers vs New Ultimates #1 of 6 is written by Millar with pencils by Leinil Francis Yu. These books go on sale in February.